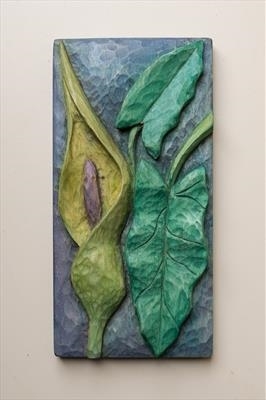 Another in the series of 8" x 4" x 1" carved relief panels of plants and flowers. This one is carved on lime, painted and varnished in the same way as the others. This piece is one of as continuing series. If the one shown on this website is no longer available I make another. While based on the same original drawing each carving will be slightly different and therefore unique. Visitors to my website may also wish to commission me to carve a plant or flower I haven't yet done.